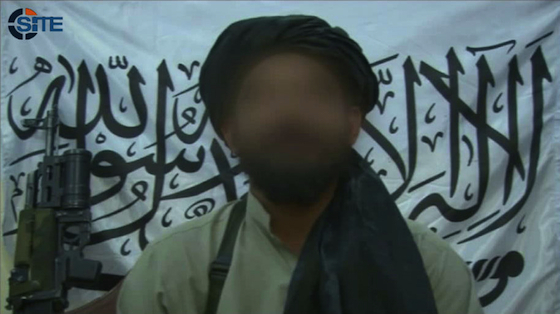 Sheikh Khalid Haqqani, the new deputy emir of the Movement of the Taliban in Pakistan, from a video released in September 2013. The Taliban blurred his face. Image from the SITE Intelligence Group. The Movement of the Taliban in Pakistan released some details on Sheikh Khalid Haqqani, a commander and “one of the top intellectuals,” who was appointed yesterday to serve as the group’s new deputy emir. “Khalid Haqqani has served as Emir of TTP’s [Tehrik-e-Taliban or Movement of the Taliban in Pakistan] former Central Shura,” according to a statement emailed to The Long War Journal by Umar Studio, the official media arm of the group. The Taliban statement was translated by the SITE Intelligence Group. “He is considered as one of the top intellectuals of TTP” and is “the force behind a fatwa [religious decree] issued by the TTP against the media,” the statement continued. Khalid’s fatwa “will be released very soon.” The Pakistani Taliban often complain of media bias and in the past have threatened and even killed members of the Pakistani media. Khalid has also participated in several Taliban attacks, according to the statement. Based on the three attacks listed, Khalid appears to have had a direct hand in the Taliban’s suicide operations for at least six years. The most deadly of the attacks in which Khalid participated was the “commando attack on FC HQ [Frontier Corps Headquarters] in Shabqadar.” The Taliban appear to be referring to the suicide attack on the Frontier Corps training facility at Shabqadar on May 13, 2011 that killed 80 Pakistani soldiers, recruits, and civilians. The Taliban said the attack was launched to avenge the death of Osama bin Laden, who was killed by US Navy SEALs in Abbottabad just 12 days prior. Back in October 2008, he was also involved in the failed suicide attack that targeted Asfandyar Wali Khan, the chief of the Awami National Party, in his home in the district of Charsadda. More recently, he was involved in the suicide attack on Dec. 22, 2012 that killed Bashir Bilour, the Minister for Local Government and Rural Development of Khyber Pakhtunkhwa province. The Taliban statement also noted that Khalid “is considered among very close associates of the martyr Hakeemullah and the martyr Qari Hussain.” Qari Hussain ran Taliban suicide camps and directed suicide operations; he is believed to have been killed in a US drone strike sometime in January 2012; the exact date of his death is unknown. Khalid has appeared in Taliban propaganda in the recent past. In September, Umar Studio released a video interview with Khalid. In that video, he castigated media coverage of the Taliban; accused Pakistani intelligence, the US, and Blackwater of conducting attacks against civilians; justified attacks against military-run mosques; and said that Afghan Taliban emir Mullah Omar is not at odds with the Pakistani Taliban’s operations. Shoot on sight>>>and that means all of them-that way the USA can’t miss. Compared to who?….Barney Rubble….I don’t mean to minimize their ability to wage war, or to generalize, but what sort of scale are they using here. The preference of these people is to live life one step above the stone age..
Ivory towers are easy to spot. Sheikh Khalid Haqqani is a suicide bombing manager. That is not exactly Aristotle material. He obviously wasn’t THAT involved in those suicide bombings. Think these folks need a bit of the my little pony elements of harmony in their lives, now that’s intellectual! That’s cute. Are TTP’s propagandists blurring faces out now to avoid biometric identification?